Despite the diversity of media that Temporary Antumbra Zone displays, the artists are all united against the clichés of sole authorship in art, in favor of the possibilities for expression that occur in the zone of collaboration. Inspiration comes at temporary moments, often during gatherings of people at differing times and places, but there's not one set idea of where this moment will take place. The idea of collaborating with another artist also comes out of this notion of temporality or not knowing; it happens when you are least expecting it. 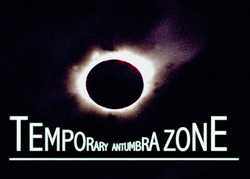 The artists in Temporary Antumbra Zone have kept the notion of collaborating open-ended and multiplicitous. Inspired by Rrose Selavy, the pseudonym Marcel Duchamp gave himself during his collaborations with Man Ray, The nineteen artist pairs have each adopted pseudonyms of their own as a way of addressing the idea of authorship of their work, which include sculpture, painting, photography, and work on paper. Each pair will be contributing one to two pieces of their collaborative work.